Quartzelec have been working with Tata Trostre plant for over 25 years providing an excellent standard of maintenance and repair services. Trostre manufacture tinplate for various industries and employ over 800 personnel. 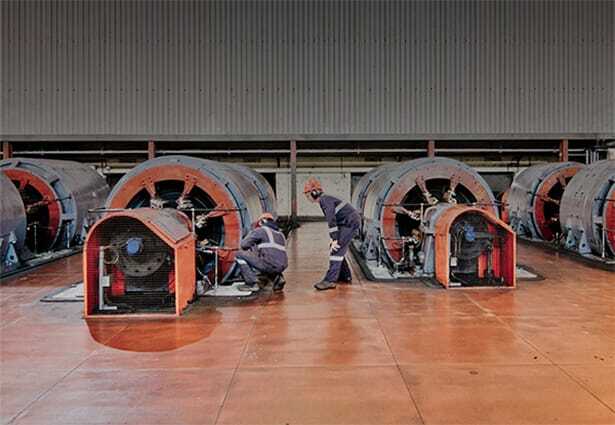 During normal operation at the Trostre plant, one of the main 5 stand Mill motors experienced a ‘flashover’ between the Commutator and Brushgear resulting in motor failure. As a trusted service partner, Quartzele's Swansea business were called upon to investigate. Through comprehensive electrical testing and in-depth knowledge of these machines, it was determined that the armature had developed a fault. Quartzelec advised Tata Trostre that an armature change was required to enable the machine to return to its full operational capability. A short window of downtime was allocated (just 3 days during the Christmas period) to allow Quartzelec to carry out this complicated and critical task. Once the machine had been fully dismantled it was noted that the bearing and seals were also damaged. Although this was a vital discovery by the Quartzelec team, it also meant that to change the bearing and seals, the overall workload would dramatically increase whilst not being able to extend the downtime. Due to a fantastic effort from Quartzelec the project was completed within the time allocated, including the substantial additional work scope. Quartzelec made a recommendation to Tata Trostre to source a replacement bearing pedestal and facilitate time to change the existing pedestal when possible. Quartzelec also determined that oil vapour from the damaged bearing and seals were the most likely root cause of the electrical fault.